'At this time the nation of the Northumbrians, that is, the nation of the Angles that live on the north side of the river Humber, with their king, Edwin, received the faith through the preaching of Paulinus, above mentioned. This Edwin, as a reward of his receiving the faith, and as an earnest of his share in the heavenly kingdom, received an increase of that which he enjoyed on earth, for he reduced under his dominion all the borders of Britain that were provinces either of the aforesaid nation, or of the Britons, a thing which no British king had ever done before; and he in like manner subjected to the English the Mevanian islands, as has been said above. The first whereof, which is to the southward, is the largest in extent, and most fruitful, containing nine hundred and sixty families, according to the English computation; the other above three hundred. 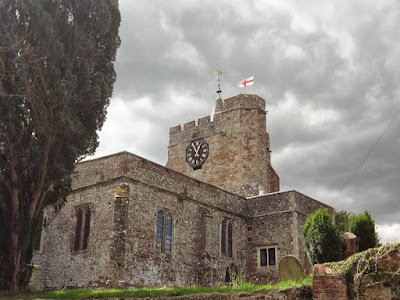 The occasion of this nation's embracing the faith was, their aforesaid king, being allied to the kings of Kent, having taken to wife Ethelberga, otherwise called Tate, daughter to King Ethelbert. He having by his ambassadors asked her in marriage of her brother Eadbald, who then reigned in Kent, was answered, "That it was not lawful to marry a Christian virgin to a pagan husband, lest the faith and the mysteries of the heavenly King should be profaned by her cohabiting with a king that was altogether a stranger to the worship of the true God." This answer being brought to Edwin by his messengers, he promised in no manner to act in opposition to the Christian faith, which the virgin professed; but would give leave to her, and all that went with her, men or women, priests or ministers, to follow their faith and worship after the custom of the Christians. Nor did he deny, but that he would embrace the same religion, if, being examined by wise persons, it should be found more holy and more worthy of God. Hereupon the virgin was promised, and sent to Edwin, and pursuant to what had been agreed on, Paulinus, a man beloved of God, was ordained bishop, to go with her, and by daily exhortations, and celebrating the heavenly mysteries, to confirm her and her company, lest they should be corrupted by the company of the pagans. Paulinus was ordained bishop by the Archbishop Justus, on the 21st day of July, in the year of our Lord 625, and so he came to King Edwin with the aforesaid virgin as a companion of their union in the flesh. But his mind was wholly bent upon reducing the nation to which he was sent to the knowledge of truth; according to the words of the apostle, "To espouse her to one husband, that he might present her as a chaste virgin to Christ." Being come into that province, he laboured much, not only to retain those that went with him, by the help of God, that they should not revolt from the faith, but, if he could, to convert some of the pagans to a state of grace by his preaching. But, as the apostle says, though he laboured long in the word, "The god of this world blinded the minds of them that believed not, lest the light of the glorious gospel of Christ should shine unto them." The next year there came into the province a certain assassin, called Eumer, sent by the king of the West-Saxons, whose name was Cuichelm, in hopes at once to deprive King Edwin of his kingdom and his life. He had a two-edged dagger, dipped in poison, to the end, that if the wound were not sufficient to kill the king, it might be performed by the venom. He came to the king on the first day of Easter, at the river Derwent, where then stood the regal city, and heing admitted as if to deliver a message from his master, whilst he was in an artful manner delivering his pretended embassy, he started on a sudden, and drawing the dagger from under his garment, assaulted the king; which Lilla, the king's beloved minister, observing, having no buckler at hand to secure the king from death, interposed his own body to receive the stroke; but the wretch struck so home, that he wounded the king through the knight's body. Being then attacked on all sides with swords, he in that confusion also slew another soldier, whose name was Forthhere. 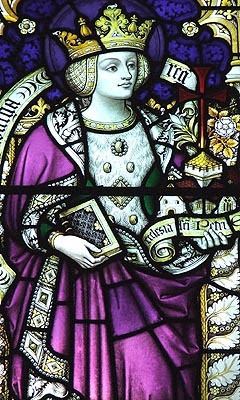 'To the illustrious lady his daughter, Queen Ethelberga, Boniface, bishop, servant of the servants of God: The goodness of our Redeemer has with much providence offered the means of salvation to the human race; which He rescued, by the shedding of his precious blood, from the bonds of captivity to the Devil; so that making his name known in divers ways to the Gentiles, they might acknowledge their Creator by embracing the mystery of the Christian faith, which thing, the mystical purification of your regeneration plainly shows to have been bestowed upon the mind of your highness by God's bounty. Our mind, therefore, has been much rejoiced in the benefit of our Lord's goodness, for that He has vouchsafed, in your conversion, to kindle a spark of the orthodox religion, by which He might the more easily inflame in his love the understanding, not only of your glorious consort, but also of all the nation that is subject to you. For we have been informed by those, who came to acquaint us with the laudable conversion of our illustrious son, King Eadbald, that your highness, also, having received the wonderful sacrament of the Christian faith, continually excels in the performance of works pious and acceptable to God. That you likewise carefully refrain from the worship of idols, and the deceits of temples and auguries, and having changed your devotion, are so wholly taken up with the love of your Redeemer, as never to cease lending your assistance for the propagation of the Christian faith. And our fatherly charity having earnestly inquired concerning your illustrious husband, we were given to understand that he still served abominable idols, and would not yield obedience or give ear to the voice of the preachers. This occasioned us no small grief, for that part of your body still remained a stranger to the knowledge of the supreme and undivided Trinity. Whereupon we, in our fatherly care, did not delay to admonish your Christian highness, exhorting you, that, with the help of the Divine inspiration, you will not defer to do that which, both in season and out of season, is required of us; that with the co-operating power of our Lord and Saviour Jesus Christ, your husband also may be added to the number of Christians; to the end that you may thereby enjoy the rights of marriage in the bond of a holy and unblemished union. For it is written, 'They two shall be in one flesh How can it be said, that there is unity between you, if he continues a stranger to the brightness of your faith, by the interposition of dark and detestable error? Where Saint Ethelburga was buried. Wherefore, applying yourself continually to prayer, do not cease to beg of the Divine Mercy the benefit of his illumination; to the end, that those whom the union of carnal affection has made in a manner but one body, may, after death, continue in perpetual union, by the bond of faith. Persist, therefore, illustrious daughter, and to the utmost of your power endeavour to soften the hardness of his heart by insinuating the Divine precepts; making him sensible how noble the mystery is which you have received by believing, and how wonderful is the reward which, by the new birth, you have merited to obtain. Inflame the coldness of his heart by the knowledge of the Holy Ghost, that by the abolition of the cold and pernicious worship of paganism, the heat of Divine faith may enlighten his understanding through your frequent exhortations; that the testimony of the holy Scripture may appear the more conspicuous, fulfilled by you, 'The unbelieving husband shall be saved by the believing wife.' For to this effect you have obtained the mercy of our Lord's goodness. that you may return with increase the fruit of faith, and the benefits entrusted in your hands; for through the assistance of his mercy we do not cease with frequent prayers to beg that you may be able to perform the same. After this Penda, king of Mercia - a fierce heathen warrior, brother of Edwin's first wife, Cwenburga - invaded Edwin's dominions and defeated the Northumbrians in the great Battle of Hatfield in Nottinghamshire. Edwin and his eldest son, Osfrith, were killed. 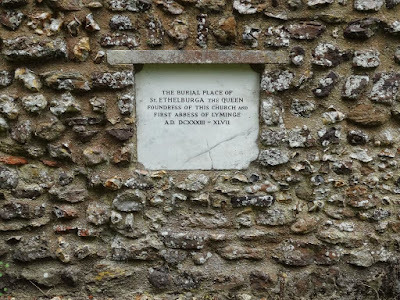 Queen Ethelburga, with Paulinus and her young children, managed to escape by sea to Kent, to the court of her brother King Edbald. She took with her many of Edwin's treasures, especially a golden cup and cross, which were preserved at Canterbury in Bede's time. 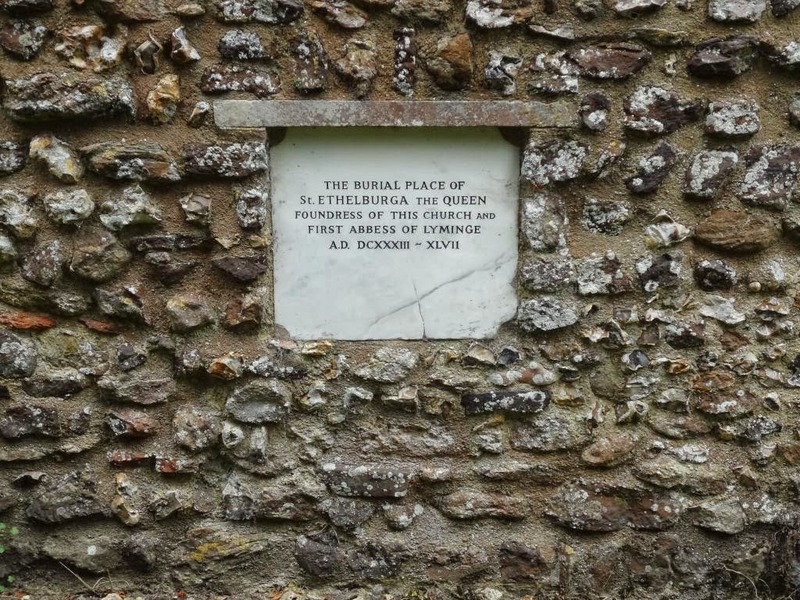 Edbald gave Ethelburga a ruined Roman villa at Lyming, between Canterbury and the sea. There, she built the first nunnery in England where she was joined by her sister Edburga of Lyming and there they both took the veil. Ethelburga sent her son, Wuscfrea, and Yffi, son of her late step-son, Osfrith, to Dagobert, King of the Franks, to be educated. They died young and were buried in France with Royal honours. Besides Wuscfrea and St. Enflaeda, she had two children, who died before their father and were buried in York Minster. 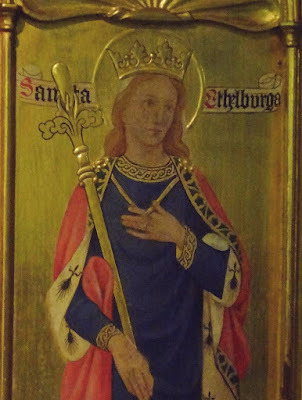 Ethelburga lived as Abbess of Lyming for several years. 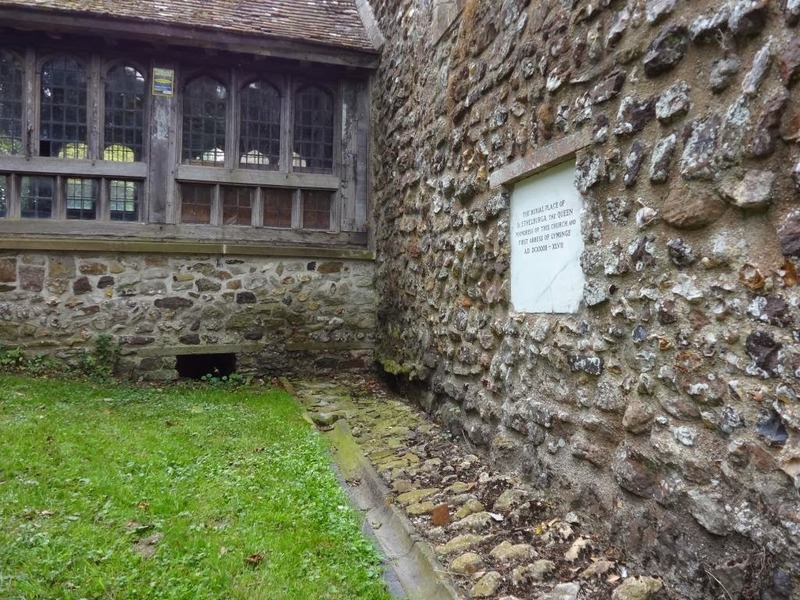 Her grave may still be seen there. 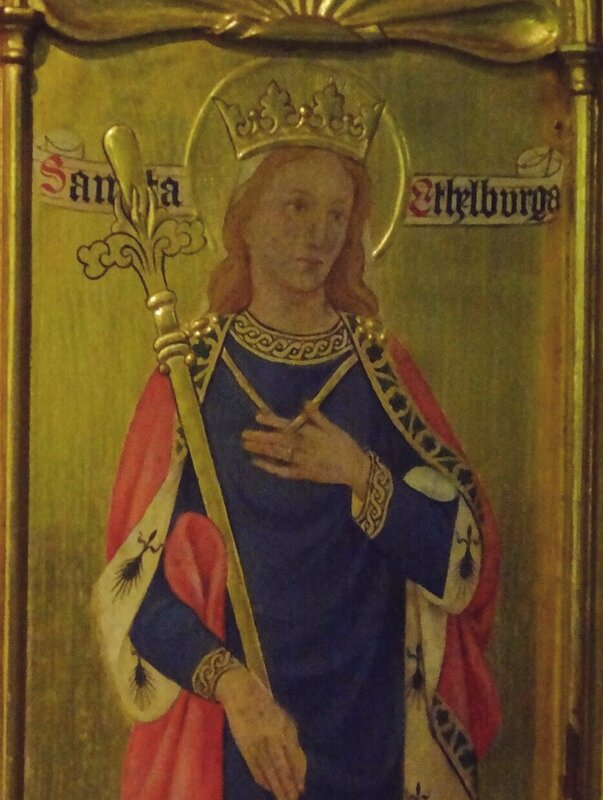 Ethelburga was the first queen and the first widow of Anglo-Saxon race to take the veil.